[Editor’s note: In the early 1990s, Silicon Graphics (SGI) was considered perhaps Silicon Valley’s hottest success story, dubbed “The “Gee Whiz” company by Business Week’s July 1994 cover story. In addition to its revolutionary computer graphics capabilities (on display from NASA’s Mars Rover and medical imaging technologies to films like “Jurassic Park” and “Toy Story”), Silicon Graphics was an innovator in the very first emerging web technologies and products. 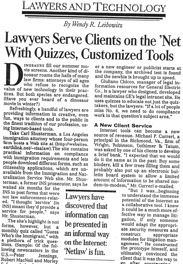 From 1991-98, I was fortunate to serve as SGI’s Trademark & Commercial Counsel – not least because it gave me access to powerful new communications tools that would not go mainstream for another decade. In noodling about how I might use SGI’s own products to better serve SGI, I created an intranet (internal, company-wide) web site to offer legal guidance and information to SGI’s thousands of employees worldwide. 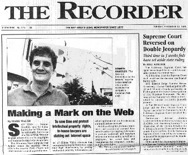 The Silicon Graphics Trademark Central site was one of the world’s very first legal intranet sites, attracting coverage from The American Lawyer, The Recorder and other legal publications. I was invited to address legal conferences about the many benefits that such intranet sites offered to large companies and organizations. 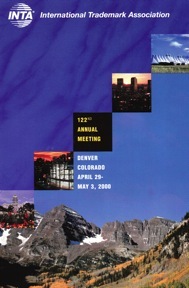 Those attending these presentations had often yet to pay even their first visit to the web). Around 600 trademark professionals attended the 2000 INTA presentation, and I have since been happy to consult with many of them (and others) in designing their own in-house trademark web sites. Trademark counsel already know that the web is the greatest trademark clearance tool ever to come along. It enables us to learn in minutes what once took weeks and months to unearth. The web is also the greatest communication and educational tool that in-house counsel have ever had. It puts you, your input and trademark program on every client’s desktop. Increasing a company’s overall trademark literacy is a major goal of every corporate trademark counsel. The better informed your workforce, the better they can protect the company’s valuable intellectual property assets. Unfortunately, we’re too busy (and outnumbered) to simply pull up a chair and sit in each client’s office all day, to be there whenever a trademark question arises. But our web sites can. An in-house (or intranet) trademark web site is available 24 hours a day, 7 days a week, in every company office worldwide. Unlike most trademark counsel, it can answer dozens of questions simultaneously, doesn’t mind repeating itself, and won’t make anyone feel self-conscious about asking. It offers clients a wealth of accessible trademark information tailored to their professional needs. And if done well, it helps build an appealing, witty and informative culture around an in-house trademark program that encourages clients to tune in and join your efforts. A corporate trademark site offers advantages in every direction. It gives clients ready access to important information to help them do their jobs more effectively. It takes the legal department out of the ivory tower and puts it to work for them in very practical terms. It provides the company as a whole with a more thorough, extensive and better trademark program, and thus greater security for its valuable trademark assets and a reduced risk of legal exposure. It also cuts legal costs by freeing up in-house counsel time to handle tasks they can do more cheaply and effectively than outside counsel. Above all, it provides in-house trademark counsel an increased profile and ready access to their clients around the world. I may work with a dozen clients in a given day, but my web site works with hundreds. It saves everyone on my team several hours per week by answering frequently asked questions and handling routine procedures (e.g., collecting clearance requests). This frees us up to work on less repetitive and more interesting matters, which we can typically handle more effectively and cheaply than outside counsel. No one misplaces my trademark lists or guidelines anymore, or looks at outdated copies. Even folks new to the company know where to find the most current version. Above all, it increases my department’s impact and my clients’ satisfaction. Before typing a single word, plan a site map (like an org chart or flow chart) mapping out the various pages, their sequence and interconnection. Don’t try to write a trademark manual. Instead, design the site as a series of related (and heavily interlinked) topic modules aimed at your different constituencies’ different needs. For example, your writers (e.g., catalogs, product manuals), advertising and corporate communications folks need trademark use information. Marketeers and branding folks need trademark creation strategies and clearance demystification. Corporate webmasters want the latest about the domain name morass. And your entire clientele will benefit from a basic trademark education site. The site’s focus should mirror that of your trademark program. In the 1990’s, Silicon Graphics was a rapidly emerging company. Our trademark program focused on establishing trademark rights in connection with new technologies and applications. 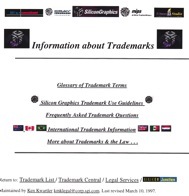 My SGI site was thus heavily oriented to trademark use and registration information. The current Nike trademark program centers more on trademark creation, strategy and clearance for a wider array of new products, and enforcement of our world-famous marks. My new Nike Trademarks web site makes these areas its priority. Your program’s focus should dictate the site’s emphasis and structure – and don’t be shy about asking your clients for input about what they want to see. Anchor the site with a basic glossary section that all other pages can link to. Don’t assume that everyone who comes to the site will enter the front door – make it simple for everyone else to catch up, no matter where they start – otherwise people may quickly get confused and log off without getting your message. Keep your readers firmly in mind. Are you writing for well-educated, over-inquisitive engineers? Business professionals who may lack legal sophistication? Kids fresh from college with marketing degrees? In any event, you probably aren’t writing for judges, opposing counsel or colleagues. So keep your text conversational, concise and witty. Your tone must reinforce your site’s accessibility. Apply humor liberally. Above all, use hyperlinks extensively. Never assume that everyone comes to your site through the front entrance, or follows your designated order. Make it easy for folks to follow topics of interest through links to other pages, or to defined terms in your glossary. Include a short, easily-digestible primer on the major points of trademark law, and make sure that this is the page everyone visits if they only visit one. It should serve as a summary of the entire site, with each sentence concisely introducing more detailed pages on each subject. Include extensive hyperlinks so that readers can follow any subjects of interest to areas of greater detail. Define every trademark or legal term your site will use that will not be instantly familiar to a layperson, from trademark to ccTLD. Hyperlink to the glossary definition each term’s first use on each of the site’s other pages – never assume that anyone will enter or leave your site through the front door. Make it easy for them to keep going, or they may depart when they bump up against first unfamiliar (and unexplained) term. Don’t expect to cover everything, but include links to other sites that can fill out the info your clients may need. For basic info, link to PTO or INTA pages. For detailed legal summaries, link to the Cornell Legal Information Institute, or other pages containing relevant international statutes. Help your clients choose a trademark strategy before they fall in love with a name that’s probably not available. Provide some background on what makes for a good trademark. Also offer idea generation tools and links to (worthwhile) outside branding sites that are more than mere commercials for their hosts. This is the most treacherous area for trademark counsel, and the most mysterious and frustrating for clients. Give them an FAQ page that answers their most common questions, and you’ll actually have time to eat lunch outside your office once a week. 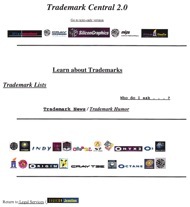 A good place to post (and update) your most recent trademark use guidelines. Be sure to explain the reasons behind the rules, and offer plenty of examples. Link to any downloadable logo sites or specs your company’s intranet may offer. Sorry, but this topic is nosing its way into even the most traditional trademark program, and your clients are as puzzled as you are. Internet domain names are one of the hottest and most obscure topics on your watch these days. Offer your clients a basic orientation in this absurd quagmire, and frequent updates of the governments’, registries’ and related organizations’ weekly flip-flopping. Help people figure out who in your department they need to contact about what subjects, and how to reach them. List staff both by subject matter and by name. The most important and visited page at my sites. Whether you want to make fun of others’ trademark foibles, or recent news headlines, or this week’s strangest or most creative marks from the OG, use this as an opportunity to entertain and educate. Don’t launch the site until it is ready. People rarely return to a newly-launched site they find to be full of pages “under construction.” You want people to trust your site immediately – make sure it is complete before launch. When you’re done coding and linking, it’s time to beta-test your work. Have your trademark team review the site, then a few key clients and legal department colleagues. Like any extensive written work, it’s easy to lose perspective, and outside input can greatly improve your work. Launch the site with much fanfare as you can drum up throughout the company. If your corporate intranet has a daily homepage, arrange to have your site featured. (see accompanying image of SGI’s home page the day we launched our first major site revision). Include it in the corporate in-house news organ, electronic or otherwise. And send out group e-mails to each client constituency, highlighting the site’s features intended to make their lives easier. Book a whirlwind tour of appearances at key staff meetings to show clients what the site offers and how they can use it to best advantage. (Note: the web site should never be a barrier to clients reaching you directly, but rather a way they can maximize your availability. Help them understand when the site is their best tool and when you are). Contact any corporate subsidiaries or major foreign offices, and either visit or arrange teleconferences; remote offices are typically the most grateful for a more direct means to communicate with a remote legal department. Then call the folks at INTA, and suggest that they do a session like this at every annual meeting to enable in-house trademark counsel to compare notes about creating and deploying trademark web sites! Trust me, your web site will be your greatest tool. Once deployed, it will quickly repay you the time it took to create, while increasing your client’s satisfaction, your company’s protection, and your own profile in the corporate culture. Ken Kwartler is currently Assistant General Counsel to Nike, Inc., the world’s leading sports and fitness company. He is responsible for an international trademark portfolio that includes several of the world’s most famous trademarks, such as “NIKE,” the Swoosh design trademark, “JUST DO IT” and the “Jumpman” design trademark. Ken handles trademark, copyright, internet-related and other intellectual property matters for Nike and its subsidiaries. After a (deservedly) short career as a musician and songwriter, Ken graduated from Boston University School of Law in 1984, where he served as Editor of the School’s Law Review. From 1984-91, he specialized in intellectual property litigation and transactions for two leading San Francisco practices, representing clients such as Apple Computer, Columbia Records (now Sony), Lucasfilm, Ltd., NeXT Computer, the San Francisco Giants and the San Francisco Chronicle. From 1991-98 Ken served as Trademark & Commercial Counsel to Silicon Graphics, Inc., a pioneer in the field of high-performance computer graphics, and one of Silicon Valley’s most dynamic companies. Ken handled intellectual property and technology licensing matters for SGI and its subsidiaries Cray Research, MIPS Technologies, and Alias|Wavefront. Ken lives in Portland, Oregon with his wife, son and daughter, and still plays an occasional musical gig.